These homemade marshmallows are fun to make, especially if you like licking the bowl, they are so good. They are so much better than the store bought marshmallows and quite easy to make. Try topping your favorite cup of hot cocoa with these luscious treats or dipping some of them in semisweet or bittersweet chocolate for a confection everyone will love. 1) In the bowl of an electric mixer, sprinkle gelatin over 1/2 cup cold water. Soak for 10 minutes. 2) Combine sugar, corn syrup, and 1/4 cup water in a small saucepan. Bring to a full boil, and let boil for 1 minute. 3) Pour boiling syrup into gelatin mixture and mix at medium-high speed. Add salt and beat at medium-high speed for 12 minutes. Add vanilla, and mix until incorporated well into mixture. 4) Scrape marshmallow mixture into a 9x9-inch square pan lined with oiled plastic wrap and spread evenly. (Note: lightly oil hands and spatula or bowl scraper). 5) After pouring marshmallow mixture into the pan, take another piece of plastic wrap and press mixture firmly into the pan; then remove the plastic wrap. 6) Place pan in refrigerator to firm up marshmallow slab for at least 4 hours or overnight. 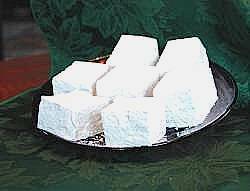 7) Take pan out of refrigerator, bring marshmallow slab to room temperature (about 15-20 minutes). 8) Remove marshmallow slab from plastic wrap lined pan; place on work surface, and coat the marshmallow slab with confectioners' sugar, trimming sides of slab to make it neat and even. Cut slab into 16-20 pieces with a chef's knife or kitchen scissors. Dredge (coat) each piece of marshmallow in confectioners' sugar, or place a few marshmallows at a time in a large bowl with confectioners's sugar and toss marshmallows in sugar. 9) Store marshmallows in an airtight container. Marshmallows will keep in container for approximately 1 week. Makes 16-20 jumbo size marshmallows. In the United States, unflavored gelatin comes in envelopes (inside a small box, which contains 4 envelopes). Each envelope contains .25 ounces, or 1/4 of an ounce (1 tablespoon) of powdered unflavored gelatine. So for this recipe, 3 envelopes are needed (or 3/4 of an ounce (3 tablespoons) of powdered unflavored gelatine, or 21 grams of unflavored powdered gelatine.) In some countries, gelatine comes in the form of gelatine sheets or leaves. Four (4 sheets or leaves) equal 1 tablespoon of powdered gelatin. That would mean that twelve (12) gelatin leaves or sheets would be needed for this recipe. These marshmallows tasted delectable in my hot chocolate, especially since it was the middle of winter. this is a great and simple receipe, never expected making marshmallows was so easy! I rolled the squares in lime and cherry jello (dry) for pretty effect, Also dipped them in melting chocolate, tasted great!! Haven't tried yet but will. Want to know if you have recipe to make the Three Musketeer Bar. Thanks! I will never look at marshmallows the same! I LOVED this recipe. I didn't even bother trimming them because I didn't want them to look too perfect; otherwise, my family wouldn't believe that I made them. They came out beautiful, creamy, and very tasty. I am going to make them for the Superbowl party and try coating them with chocolate and nuts. Delicious!! I Love This Recipe. I've tried it at my new chocolates business and I Love It! THEESE ARE THE BEST. I LOVE THEM. THANK YOU SO MUCH. THESE MARSHMALLOWS ARE THE BEST EVER!!! WHAT A TREAT TO MAKE AND COVER IN CHOCOLATE AND NUTS!!!!! THANKS SO MUCH FOR SHARING THIS SPECIAL TREAT!!!!! Never thought a marshmallow could taste like this. Making it for Christmas for my allergy-sensitive niece (she can eat these!). These were the best things i have ever made! I've tried several marshmallow recipes, but this is my favorite. It never fails, no matter the local humidity, it's easy to change the flavoring, and has great texture. This is my absolute 'go to' recipe for homemade marshmallows!